Phoenix, Arizona, USA, one of the ten urban locations where black widow spiders were collected for the CAP-LTER study. Paving paradise to put up a parking lot may not be so bad if you’re a Western black widow spider. 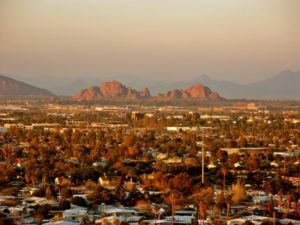 Although urbanization generally fragments habitat, a recent study by Lindsay Miles in association with the Central Arizona-Phoenix LTER found that urban environments can actually facilitate gene flow. Specifically, they found that spider populations in urban study locations were more diverse than expected, and urban and rural populations were not as genetically distinct from each other as expected. Miles and her team sequenced the genomes of spiders from ten urban and ten rural locations to determine how closely spiders within a location were related to each other, and how diverse a location’s population was compared to other study sites. They then analyzed gene flow between urban and rural spider populations, and between all study locations. Urbanization is a main cause of habitat fragmentation, which can physically isolate individuals and populations within a species, leading to a higher risk of that species’ decline — locally and globally. Depending on the species, some urban barriers can be overcome, but on the whole, urbanization typically restricts individuals from moving freely across habitats and reduces the pool of available mates. The loss of genetic diversity in isolated populations has been linked to a reduction in that species’ ability to adapt to changing conditions. This means that the species we share developed areas with are not always the ones we would like to be around, but rather the ones that have been most successful at adapting to our presence — such as rats, pigeons, and cockroaches. The Western black widow spider is one such ‘urban adapter,’ and was used in this study to investigate how human pressure affects the population genetics of urban wildlife. Understanding how species respond to urbanization has value beyond species conservation. Black widow abundance has implications for ecosystem and human health; they are considered a pest species and are venomous to people. Like most other web-building spiders, black widows favor specific places to build webs, and females do not travel far during their several year lifespan. Learning how their populations are affected by urbanization can help with pest control and public health efforts, as well as ecological studies. As urban development encroaches on natural places, it continues to be important to study how natural systems respond. The findings of Miles et. al. lend insight into an important concept: not all species are negatively impacted by urbanization, and human activity could be selecting for the survival of some species over others. Miles LS, Johnson JC, Dyer RJ, Verrelli BC. 2018. Urbanization as a facilitator of gene flow in a human health pest. Molecular Ecology 27:3219–3230.